From almost imperceptible movements and awkward gestures, Diāna Tamane follows traffic routes from Eastern to Western Europe, so during the working process her family members become the main characters. That’s the artist’s dad, who has been regularly traveling to Germany since the 90s, purchasing cars, electronic equipment and other stuff and selling them in Latvia, and that’s her mom, who became a long-distance truck driver a few years ago, when her business went bankrupt. The artist’s first exhibition in Latvia is a documentation, arising from Tamane’s mother’s experiences. The exhibition title Message: 147 of 494 is taken from the exhibited video “Letters from mom”, it represents a letter sequence in the mother and daughter conversation in Tamane’s e-mail inbox. 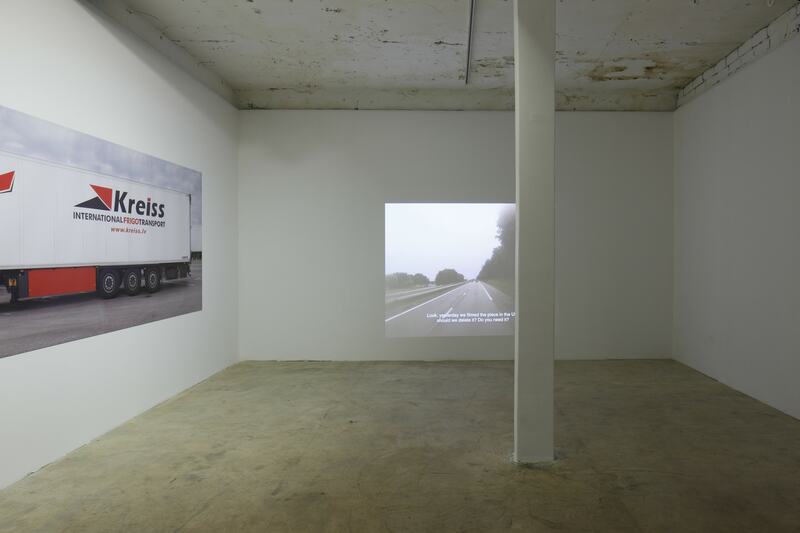 The exhibition also includes a video entitled “On the Road” – a static video shot taken from a lorry’s front window with a phone conversation in the background; it’s placed in a dialogue with a large-scale photo print “Mom” and is exhibited beside text that contains information about Tamane’s mother’s movements across Europe in the last year: where she drove A-Z, what goods she transported A-Z. What began as an activity reinforcing kinship ties, incorporating family members in Tamane’s works has now become an autonomous adventure with an element of a play and constant participants. The family is viewed as a reduced version of society, in which the prevailing relationships are always intense – regardless of whether the family is united in harmony or conflict. Beside her own documented shots, working with video, text and found objects, Tamane regularly uses vernacular photography taken by her family members, whose involvement in the artistic act is regularly accompanied by tension and flickers of emotion. 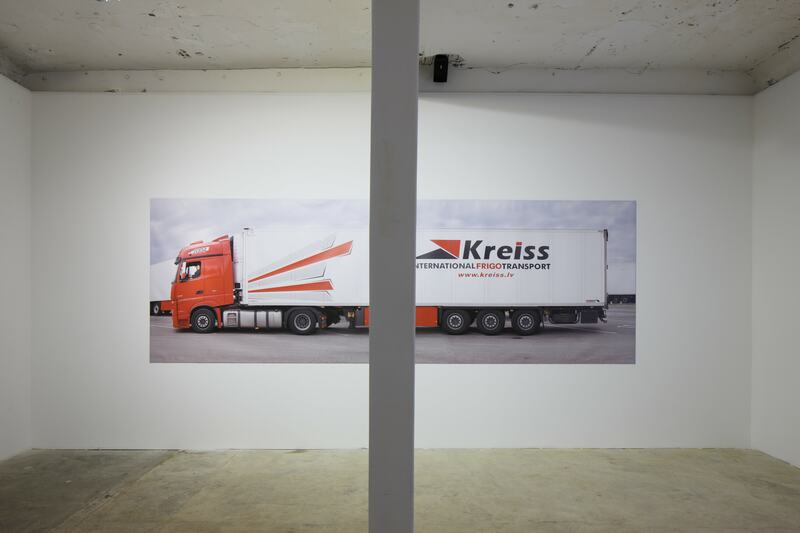 Along with an interest in relationship psychology, her practice also considers the social and economic facets. Through the exhibition’s implicit main character – Tatjana Tamane, a representative of a stereotypically “unwomanly” profession, the artist draws attention to her observations about a woman who grew up in Soviet Latvia and who shaped her views in today’s language of distinctive character and symbolism. In Soviet-era propaganda posters the ideal woman was shown being strong and cheerful, posing in front of the constantly growing housing blocks, a factory or driving a tractor. 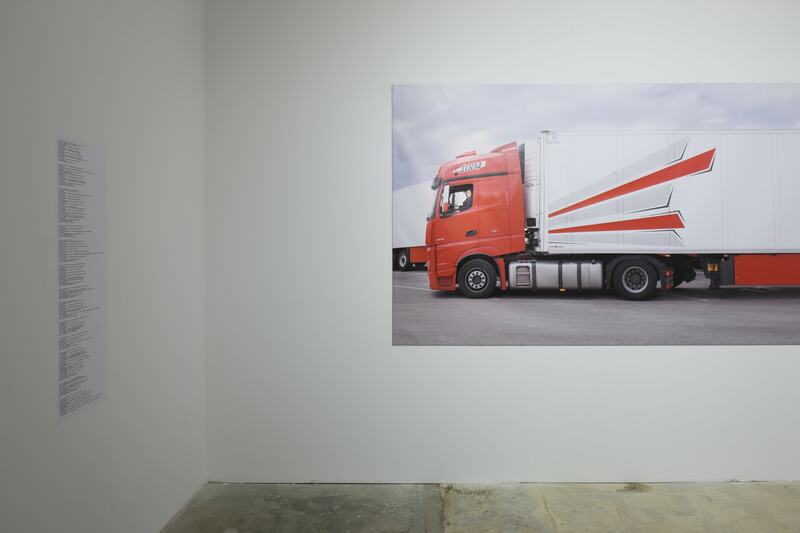 Tamane’s mother’s large-scale portrait behind the wheel of a glossy and sizably impressive vehicle, becomes a direct reflection of this experience and memory. Viewed all together, Tamane’s work covers questions concerning family, the origin of working class aesthetics, the role of women in society and the new social order. This theme follows the changes in the region in the early 90s; by highlighting social processes, labour relations and the dynamics of mobility, the artist creates her own version of a contemporary post-Soviet society’s portrait. Diāna Tamane (b. 1986), born in Riga, graduated from the Tartu Art College, received a Masters Degree at the Sint-Lukas Brussels University of Art and is currently studying at the HISK Institute in Belgium. She primarily works with photography and video as she examines themes of identity, memory and familial ties – closeness and estrangement. Tamane has had several solo-exhibitions: Art House Tartu; Recyclart Brussels; Y galerii Tartu, and has participated in group exhibitions in Belgium, Russia, Turkey, Estonia, Lithuania and Latvia. Currently her work is on view at the HISK laureate group exhibition The Empty Fox Hole. In the summer of 2016, Tamane received the Modern Art Museum Friends of S.M.A.K. award in Ghent, and was also selected as the New Belgian Talent for the publication tiff, which is published by FoMu, the Photo Museum in Antwerp.